Home › FAQ › What High School Classes Prepare a Student For College? 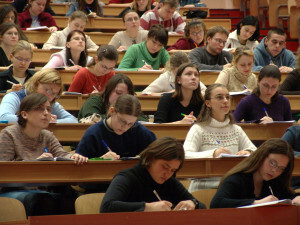 Secondary schools nationwide design curricula for high school classes that prepare a student for college. These programs fall in line with state and federal regulations that outline the subject matter to master for a standard or advanced diploma. Though class requirements may vary by state, core subject material covers similar components of math, English, science, social studies and technology. Electives are used to personalize and round out diploma requirements. High schools look to government initiatives, such as the Race to the Top and Common Core, along with state and regional needs to implement and align curricula with standards that provide students with the best preparation for college and career preparation. A standard diploma curriculum acts as a starting place for students to begin high school studies with college in mind, especially for those who do not have defined career goals. Once students begin their secondary studies, it is not unusual for them to move into advanced high school classes that prepare a student for more academically challenging programs at larger universities. Students who enter advanced diploma tracks typically have a career choice in mind or have pinpointed learning aptitudes for particular areas of study. Secondary students usually meet with a guidance or career counselor prior to develop a four-year study plan and revise it annually. They will update career assessments and interest inventories to align their studies more accurately with post-secondary goals. These types of assessments are ongoing to reflect current learning aptitudes, interests and skills as they relate to college preparation studies. Diploma requirements based on essential academic foundations prepare high school graduates with the college-and-career-readiness skills necessary to be successful in post-secondary endeavors. These foundations are constructed from government guidelines, regional needs and post-secondary recommendations. Personalized curriculum plans can then be designed featuring high school classes that prepare a student for college.